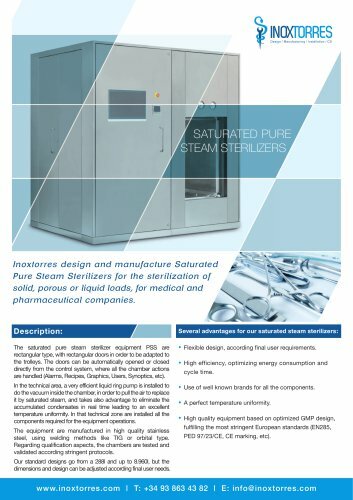 Design / Manufacturing / Installation / CS SATURATED PURE STEAM STERILIZERS I nox torres des ig n a nd ma nu fact u re Sa t u ra ted Pu re S tea m S teril i zers for t he steril i za t ion of solid, porous or liquid loads, for medical and pharmaceutical companies. Several advantages for our saturated steam sterilizers: The saturated pure sterilizer-28282.html">steam sterilizer equipment PSS are rectangular type, with rectangular doors in order to be adapted to the trolleys. The doors can be automatically opened or closed directly from the control system, where all the chamber actions are handled (Alarms, Recipes, Graphics, Users, Synoptics, etc). Flexible design, according final user requirements. High efficiency, optimizing energy consumption and cycle time. In the technical area, a very efficient liquid ring pump is installed to do the vacuum inside the chamber, in order to pull the air to replace it by saturated steam, and takes also advantage to eliminate the accumulated condensates in real time leading to an excellent temperature uniformity. In that technical zone are installed all the components required for the equipment operations. Use of well known brands for all the components. A perfect temperature uniformity. High quality equipment based on optimized GMP design, fulfilling the most stringent European standards (EN285, PED 97/23/CE, CE marking, etc). The equipment are manufactured in high quality stainless steel, using welding methods like TIG or orbital type. Regarding qualification aspects, the chambers are tested and validated according stringent protocols. Our standard designs go from a 288l and up to 8.960l, but the dimensions and design can be adjusted according final user needs.